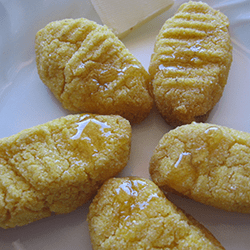 Pones are an old Southern tradition of preparing corn meal in hand shaped ovals. Place well greased cast iron skillet, pan or mold in oven while preparing mixture. Mix ingredients together thoroughly in a a bowl to a consistency that can be shaped with hands if preparing Pones. Cook for 25 minutes until brown. Serve hot. Using the same ingredients above add more milk or water to create a soupy mixture. Pour a thin layer into a well greased hot frying pan on the stove. Allow to brown and turn over. Combine corn meal and boiling water in bowl; stir to blend. In large skillet, heat 1/4-inch chortening over medium low heat until a drop of water sizzles when dropped in skillet. Spoon batter, by tablespoonfuls into hot skillet. Fry until golden brown each side; turn once. Serve hot with butter. Makes about 10 hoe cakes.